The first videos released of the Thai boys rescued after 17 days trapped deep in a flooded cave showed them to be thinner but in good spirits, as they waved from their hospital beds. In the video clips shown at a press conference yesterday evening, the boys could be seen sitting up in bed and wearing face masks as they waved or made peace signs. Relatives were seen standing outside the glassed-off room, sealed to prevent the boys from catching an infection in their weakened state. The 12 boys lost an average of 2kg as a result of their ordeal but were otherwise in good health, a senior official said yesterday. "From our assessment, they are in good condition and not stressed," said Dr Thongchai Lertwilairatanapong, an inspector for Thailand's Health Department. "None of them has serious condition deriving from lack of food." Doctors had feared the boys and their coach might have been exposed to diseases carried by bats, a fungal infection sometimes called "cave disease", or the water-borne bacterial disease leptospirosis. "Almost all of the boys have been found to have high level of white blood cells, a sign of infection. So, antibiotics are being given," said Dr Thongchai. Despite their good progress, all of them will remain in hospital to allow doctors to monitor their physical and mental recovery. The 12-member Wild Boars soccer team, aged 11 to 16, and their 25-year-old coach were brought out of the Tham Luang cave over three days from Sunday in a rescue mission that gripped the world. Thais celebrated the miraculous rescue which received blanket media coverage, with The Nation running the headline "Hooyah! Mission accomplished" and the Bangkok Post emblazoned with "All Wild Boars saved". There was joy overseas too. France midfielder Paul Pogba dedicated his side's football World Cup 1-0 semi-final win over Belgium to the boys, writing on his official Twitter account: "This victory goes to the heroes of the day, well done boys, you are so strong." Rescue mission chief Narongsak Osottanakorn told the press conference yesterday that the boys were just being children when they got lost, and no one was to blame. "We don't see the children as at fault or as heroes. They are children being children, it was an accident," Mr Narongsak said. He said the international rescue team had to think carefully before making decisions, and had to be confident before they attempted the daring extraction through narrow tunnels and murky waters. A key concern was how to keep the boys, with no diving experience and in a weakened state, calm during the hours-long ordeal. 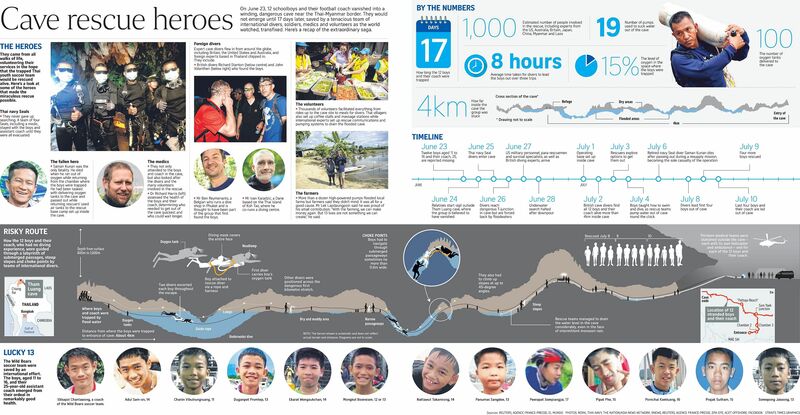 A former Thai navy Seal who was the last diver to leave the Tham Luang complex told Agence France-Presse that the boys were passed "sleeping" on stretchers through the treacherous pathways. "Some of them were asleep, some of them were wiggling their fingers... (as if) groggy, but they were breathing," Commander Chaiyananta Peeranarong said. Thais were overjoyed by the successful rescue, which has injected a sense of optimism in a country divided by military rule. "Great things can be achieved when people from various nations work together for a common goal."